Lorenzo Da Ponte, librettist of Mozart's famous opera, entitled it "Don Giovanni, the profligate punished". So permit us this irreverent paraphrasing of the title in briefly summing up a boat: the Don Giovanni to be precise, built as a working vessel and then given a new life with restoration at the Tecnomar yard in Fiumicino. 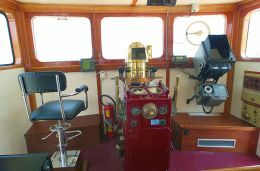 This 30 metre tug, built in 1964 in Kobe, Japan, has been completely reconditioned and, especially internally, transformed into a luxury cruising yacht of unmistakeable appearance. Propulsion: two variable pitch screws sheathed in skirts that also function as rudders. 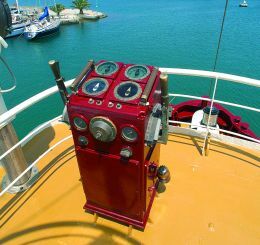 Their use is asynchronous in the sense that the steering apparatus can be activated independently for total control of the vessel under manoeuvre. Over the last few years there has been a generational change in tugboat design. 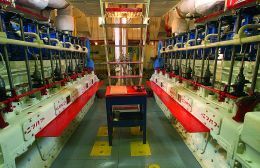 Furthermore, new technologies have appeared on the market capable of specifically modifying the performances of these recent generation vessels, thanks to the introduction of new design methodologies involving both hulls and propulsion systems. This is why many tugs dating to the 60's-70's, which lend themselves well to transformation from working to pleasure craft, have become attractive to an increasingly larger slice of the market, enchanted by their appearance, their powerful construction and the history these vessels bring with them, consisting of tough sailing and deeds of salvage or rescue in Captains Courageous style and so on. Moreover one need only go round the Mediterranean marinas to see just how widespread is this "phenomenon" of refitting tugs: there are already plenty of reconditioned ones, proud in their essence of unstoppable workboats yet at the same time with nothing to envy in comparison with the fitting-out and furnishings of modern exploration type superyachts. But we are also sure of the extent to which this trend has yet to achieve full expression. This is valid also at national level where, among other things, there are already yards which in a short space of time have managed to become specialised in the "care" of vintage tugs. The skill they have shown in converting that specific type of workboat has led to increasingly frequent contacts with owners in search of their "different" vessel. 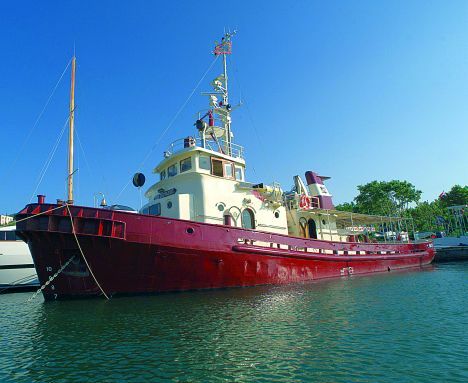 An emblematic example is the Tecnomar yard in Fiumicino, just outside Rome, which has become an actual reference point for enthusiasts since its splendid restoration of the now famous "Pietro Micca", a historic 1895 tugboat. From its quays along the Tiber several tug/yachts have already weighed anchor, cleaned and polished till they seemed brand new. Including the Don Giovanni which we present in these pages. First of all let's retrace the boat's history. Launched in 1964 in Kobe, Japan, with a twin sister ship later sold in England, the Don Giovanni worked for years shuttling between Singapore and Abidjan, transporting materials for building the port of the Ivory Coast capital, and therefore sailing tough routes on voyages that lasted three months. Subsequently the boat sailed to England and the Mediterranean, finally ending up in Cagliari. "In 1979," says Giuseppe Costignola, who worked on the Don Giovanni for more than 16 years and also followed the restoration, "Sarge Navi bought the vessel and took her to Naples for reconditioning and various modifications, an operation that went on for practically a year. In Salerno in 1980 the ship was put to work on construction of the Campania city's port, transporting tanks of cement from Naples. In the same period she also did some towing to Sardinia and, since she was the biggest vessel in the tug fleet based in Salerno, she was also called in for a series of tough rescue assignments, all concluded with honour." A memorable one occurred in 1985 when our tug saved the "Gracechurch Star" (a 6200 ton ship flying the Bahamas flag) which had got into serious difficulties 100 miles south of Salerno. In 1994 the history of the Don Giovanni arrived at a crossroads. After six months of inactivity, still in Salerno, the vessel was laid up and probably destined to be scrapped. Then Tecnomar's Pierpaolo Giua bought the tug and had it towed to Fiumicino by no other ship than the "Pietro Micca". 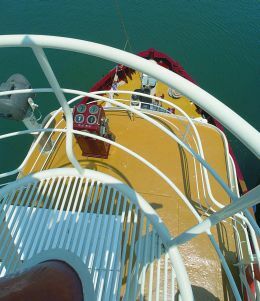 There on the Tiber, in the yard directed by Emiliano Parenti, a definitive restoration was begun to the plan of architect Antonello Pistoia and captain Silvio Caracci, already well known for their supervision of the refitting of "Monitor" some twenty years earlier, probably the first tug in Italy to be transformed into a pleasure craft. Before starting the works the ship underwent numerous evaluations, after which it was decided to proceed with two distinct phases, the first dealing with checking, verification and replacement where necessary of the whole strictly technical part. A complex piece of work requiring, we may say, the patience of a Job since the input from the new owner was to leave the essence and aesthetic aspects of the Don Giovanni absolutely unaltered, just as they had been envisaged by the Japanese designers forty years earlier. So everything was checked, reconditioned or replaced, including engines, steering gear and plant systems, right down to complete sandblasting of the hull in order to carry out a full scale reconditioning. 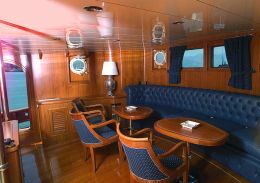 The second phase followed the Italian Naval Registry surveys: after a demanding series of sea tests, aimed at checking the vessel's total efficiency under way, work was concentrated exclusively on the interiors. 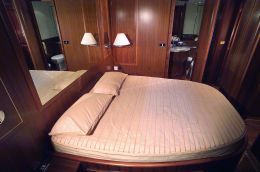 It took about 10 months to make them what they are today, with a layout subdivided into three cabins. 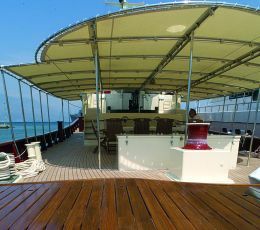 The great teak deck was also brought back to new, together with many other details: Pistoia and Caracci supervised not only the aesthetic but also the functional aspects, in line with the most modern standards. Much credit for the result of course goes to the highly qualified workforce, professionals with a long track record, such as master shipbuilder Giorgio Rossi, but also metalworkers, welders, pipe fitters, carpenters etc., a team of experts who with targeted, non-invasive interventions succeeded in giving new life to this ship. 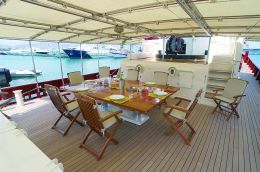 So interiors, exteriors, bathrooms, ceilings, floors and companionways were done in teak, sometimes polished but more often satined. And then leather for the sofas, precious materials for the coverings and classic but never over-splendiferous furnishing complements. 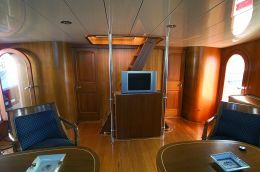 The current fittings also include certain vintage "gems" such as the clock and armchair on the bridge, taken from the USS Springfield, an American cruiser launched at the end of the second world war, and the Plath sextant and the mechanical chronometer that belong to seafaring history. 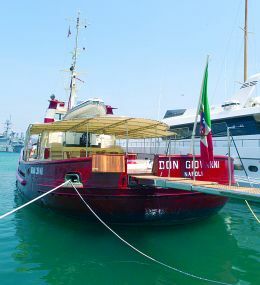 For the record, in spite of its conversion to a pleasure craft the Don Giovanni still remains a tugboat, and as such is always available in situations difficult for other vessels. Thanks also to the fully restored efficiency of her towing equipment, near Porto Cervo in August 2002 she saved another glory of the nautical world, the famous yawl "Moonbeam" designed at the beginning of the century by William Fife Junior.